The Canossa Treestand consists of a remnant forest patch located near a future school site. The site is comprised mainly of deciduous trees with an open grass meadow patch towards the centre of the stand. A moist wet meadow is also present towards the northern end of the treestand. The variety in habitat types ensures a great diversity of wildlife and plant species. 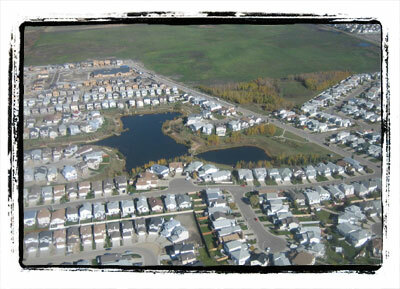 The treestand is also located directly across 115 St. from the Canossa constructed wetland which provides excellent opportunities for wildlife viewing and nature appreciation. Informal trails around and through many parts of the treestand. 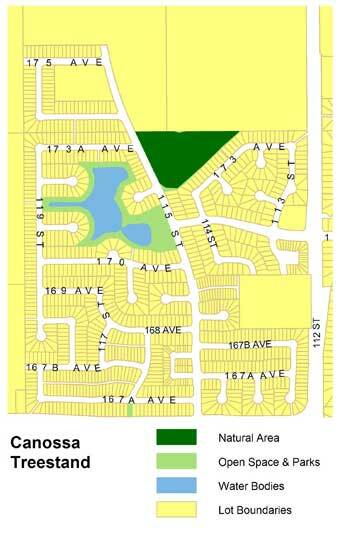 Canossa Treestand is located along the east side of 115 St. at approximately 173 Ave. Informal trails provide access around and through the treestand and parking is available at the west side of the treestand just off of the east side of 115 St. The treestand is also accessible via a greenway off 173 Ave. This treestand provides foraging habitat and cover for many bird species and small mammals. Since the Canossa Treestand is located along the fringe of urban development, there are also possibilities of viewing species that are less common in more urbanized areas, such as white-tailed deer and coyote. The Canossa constructed wetland is also an excellent site for nature appreciation and has a great diversity of both plant and animal species.